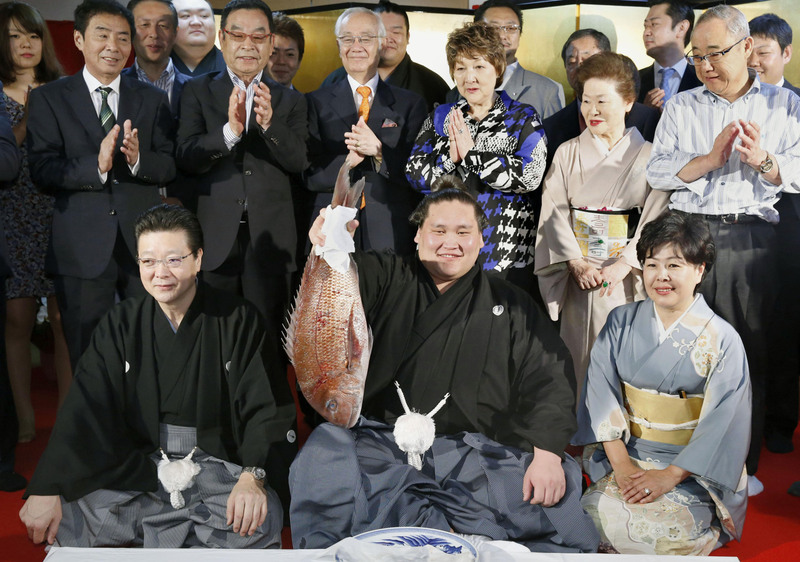 Takakeisho, winner of this year’s Kyushu tournament, was pictured alongside his stablemaster on Nov. 26 holding up a large red sea bream and drinking sake from an outsized trophy at a celebratory event. 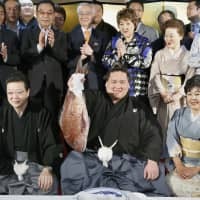 While there was nothing noteworthy in the scene itself — such parties are standard fare for tournament champions — the fact that the stablemaster was Chiganoura rather than Takanohana would have surprised anyone who hadn’t been paying attention to the sport for the past couple of months. The latter man’s sudden retirement from the sumo world in September meant the stable that bore his name had to close and its wrestlers transfer to Chiganoura Beya. That must have made the aforementioned victory party one of mixed emotions for Takakeisho as he sat smiling with a man he barely knew in Chiganoura, while his coach and mentor of the past four years was nowhere to be seen. Normally the events are joyous and emotional occasions for first time winners as they celebrate alongside the man most responsible for getting them to that point, and the person with whom they have usually shared the daily highs and lows of training over the course of many years. Indeed the 22 year old, who joined professional sumo while still a high school student, has barely spent any time at all in his new stable’s premises just north of Asakusa. The autumn regional tour kicked off soon after Takanohana Beya closed and immediately following that the entire Sumo Association decamped to Fukuoka for the tournament there. Wrestlers changing stables is a rare enough occurrence in sumo, but Takakeisho is far from the only rikishi in recent years to have lifted the Emperor’s Cup after such a move. Terunofuji won the May 2015 tournament while a member of Isegahama Stable. His first few years in sumo though were in Magaki Beya where he fought under the ring name Wakamisho. If Takakeisho’s switch to Chiganoura Beya came too soon before his title to be credited with having any part in that win, Terunofuji’s move to Isegahama not only propelled him to a tournament victory and promotion to sumo’s second highest rank, but indeed saved his entire sumo career. Before Magaki Beya closed down in 2013 it had become a shadow of its former self. With the stablemaster normally away in Nagoya receiving treatment for a stroke suffered a few years previously, the stable gradually lost wrestlers and coaches. At the end it wasn’t uncommon to see the future Terunofuji training alone in the ring in the mornings. The future ozeki confided to me at one point that he was close to quitting the sport altogether, as a lack of decent training and a few bad tournament results had sapped his motivation. After the move to Isegahama, though, he was a changed man. Surrounded by high-level veterans including a yokozuna in fellow Mongolian Harumafuji, Terunofuji thrived. As with Takakeisho, Kyokutenho won a championship in his first tournament after switching stables. In the case of the former Oshima Stable wrestler, however, the victory was even more unexpected. Having been part of the initial Mongolian contingent in sumo, the 37-year-old was a veteran journeyman who had never threatened the top rankers over his course of his 20-year career. Once expected to retire when Oshima closed, Kyokutenho instead moved with all his stablemates to Tomozuna Beya and promptly won the Emperor’s Cup. When he finally hung up his mawashi, the Nalaikh native took over Tomozuna Beya and is currently the stablemaster there. Ozeki Baruto likewise won his only title as a member of Onoe Beya after originally joining Mihogaseki stable in 2004. The Estonian’s situation was slightly different from other moves as he branched out with the oyakata (sumo elder) who recruited him to create an entirely new stable. Other rikishi have changed heya technically if not in a real sense. Asashoryu won all 25 of his Emperor’s Cups under the Takasago Beya name after that stable merged with his original Wakamatsu stable. Not all moves go so well, which is hardly surprising considering that sumo stables are closer to families than sports teams. Sometimes the circumstances surrounding a change of stable can be so traumatic that rikishi choose to retire rather than move. That’s most often seen when the switch is the result of the previous stablemaster’s death. More recently, a mass resignation occurred after the JSA forced Kasugayama oyakata out of the association and closed his stable. Several wrestlers at the heya took the unprecedented step of holding a press conference to demand he be allowed to stay on. When that demand wasn’t met, 11 retired rather than move to Oitekaze Beya. Even when things go well there is almost always a closer bond between wrestlers who were in a previous stable together than there is between them and their new stablemates. You only need glance at the social media accounts of the two remaining Magaki Beya rikishi to see evidence of that. Given how stressful heya changes can be, spare a thought for 31-year-old Daiisshin. The Fukuoka native has seen three stables which he has belonged to close down. He now belongs to Isegahama Beya — which bears no relation his original sumo home, Isegahama Stable.